After the strange feelings, and weird structures, that I experienced yesterday at the Devil’s Gate Dam, I decided to do a little bit of research on the site. The Devil’s Gate Dam was the first flood control dam in Los Angeles County. Built in 1920, the dam is located at the narrowest spot in the Arroyo Seco. In the section where they wanted to construct the dam, there was a rock formation that resembled the profile of a devil, hence the naming of the dam as the Devil’s Gate. On the Dam with JPL to the North. Together, Parsons, Crowley and Hubbard believed that the Devil’s Gate area held great magical power and energy that could increase their own powers. Many believe this is why Parsons chose this area as the location for JPL. It was the perfect place for these three men to conduct their magical rituals and work on their project that was referred to as “Babylon Working,” a summoning of the entity known as Babylon that would aid them in the creation of an “anti-Christ,” a child who would eventually destroy mankind. I’m not sure if it is really a portal to Hell but I can say, after my visit, that there is something dark and sinister there. 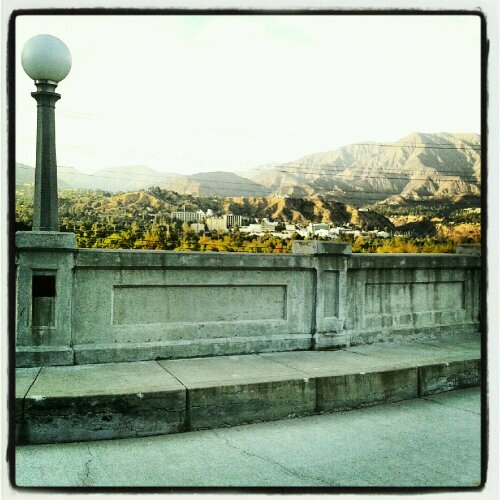 But for me, I felt it more in the area south of the Dam, the part of the Arroyo Seco that will lead you to “Suicide Bridge.” The area to the north with the beautiful view of the mountains and all of the willow trees in the canyon, it seemed more serene. But I didn’t actually walk down in that area. This is one of the Obelisks located on the north side of the dam. 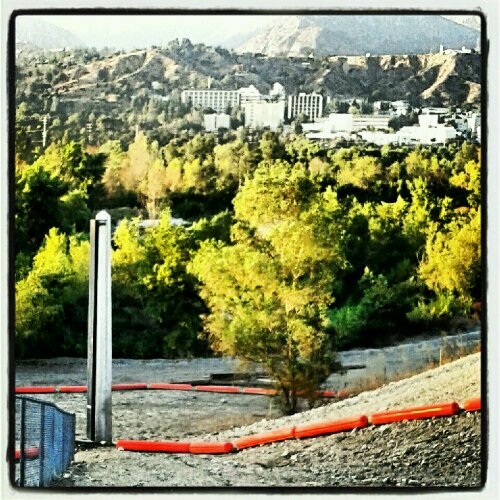 You can see Parsons’ JPL in the distance. Though I did think it was strange to see obelisks on that side of the dam. In ancient times, a pair of obelisks were placed in front of a pylon, a greek term for a monumental gateway. There were two obelisks but they were located off to the side, closer to the east side of the dam. Actually, now that I think about it, the obelisks were on either side of a rock formation. I may have to go back there for further investigation. 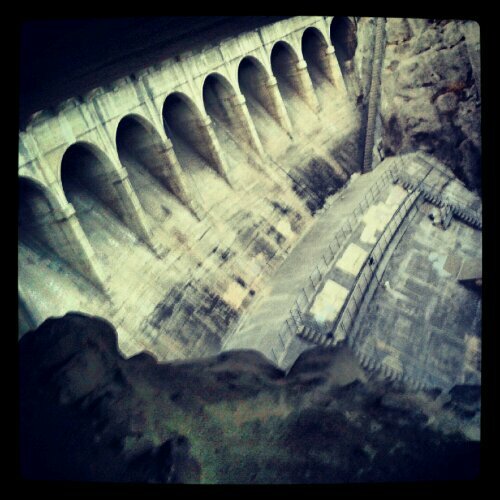 The south side of the dam is the part that freaked me out the most. In order to get there from the top of the dam, you had to walk through this dark tunnel under Oak Grove Drive. Walking through it just gave me the chills and it was 92 degrees out. As I reached the edge and looked into the canyon, I couldn’t see the dam. There was a rocky path to the left. It probably wasn’t my best idea but I decided to walk down that path, regretting my decision once it was too late to turn back. The path was covered with rocks, making the path hard to navigate and it was quite slippery. I started to think that maybe the rocks were there to deter people from going down into the canyon. But it was too late for me. 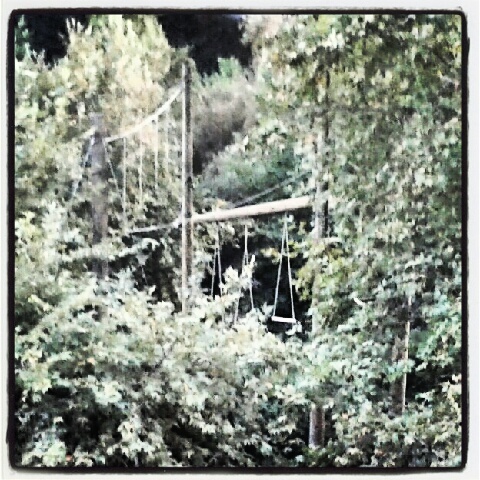 Then half way down, out in the distance amongst the trees, I noticed ropes hanging. It looked like those old lynching trees that were in the history books. I immediately looked up the trail, wondering if I should turn back. Every instinct was telling me to turn back but the writer in me was telling me to continue on my path. I listened to the writer. And it helped to see people jogging on a path below. Ropes hanging from the trees on the south side of the Dam. I finally reached the bottom and to my right, I saw a clearing and a trash can. I stopped dead in my tracks when I reached the clearing. There was this wooden structure in front of me. I now knew that the ropes were actually attached to swings, high up on the structure–too high for anyone to actually swing on. Then I also noticed that there were symbols attached to the ropes in the front part of the structure. Instantly, my mind thought these were satanic symbols of some sort. On my hike to the Dam, I kept seeing the roman numeral 4 painted on all the rocks. That could just be teenagers messing around but this, this was something significant. There was a warning sign posted on the front, right beam of the structure. But I couldn’t move. Everything inside of me, my instincts and the writer, told me not to go toward the structure. I used my phone to take a picture and then I turned around and continued on my journey. But I couldn’t get the weird symbols out of my head. It looked like an equals sign, with an X (multiplication) under it and a plus sign that had been stretched into a cross. All three symbols were tied together on the same ropes, creating one big symbol. If this were Burning Man, this would be an art piece making a commentary on education and religion (the swings for school aged kids)–now this is my interpretation. But when something like this is located in an area called “Devil’s Gate” and is considered one of the seven portals to hell, I’m pretty sure it isn’t an art piece. Where are the Supernatural Winchester boys when you need them? I am definitely going to need to do some more research on this area and the symbols I saw. There just might be another trip over there in my future. If you are interested in other stories about the Devil’s Gate Dam, check out the links listed below. The History of the Dam, according to Weird California. A Ghost Hunt, as well as History account of the Dam, conducted by the Los Angeles Ghost Patrol. The History of the Arroyo Seco Area. I like these photos. They make me wish I could roam around there and do some research. Thank you for your description and the photos. Roman numeral 4 backwards is 6…. Interesting. I didn’t even realize that. 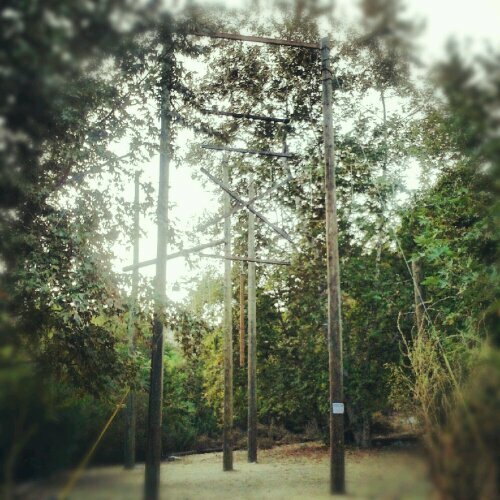 The wood structure with the ropes is a ropes course for a local camp. I believe Tom Sawyer Camps use it. I run in the area south of Devil’s Gate and North in Hahamongna. Sometimes a bit creepy, but haven’t seen anything too odd. Interesting urban tales..
going there later today. I’ll let you know what I see. I spoke with the dam operator who is from the area. Very nice man. He heard of gross stories of dead little boys but nothing verified. He said he heard kids crying there in the middle of the night when he camped there but we both agreed it was probably coyotes. It was personally creepy for me as it was near my high school– a place I hated and have never gone back to in over 20 years. I had no idea it was next to this place. Love this post and the photos. Stay curious and keep investigating! The whole place looks like it needs a major Feng Shui overhall.